Winter had interrupted fall for over a week, putting a stop to migration for some of the birds. I had made my way to the marsh near the Cave and Basin NHSC, where the warm thermal water kept spring like conditions for the birds that where taking a pause from heading south. I stood with the camera in hands as several different species of birds, numbering between 35 and 40, feeding away several meters from me. Every now and then some would look toward me, making sure they were safe distance from me. I moved slowly at my spot, taking pictures as some of the birds got closer. 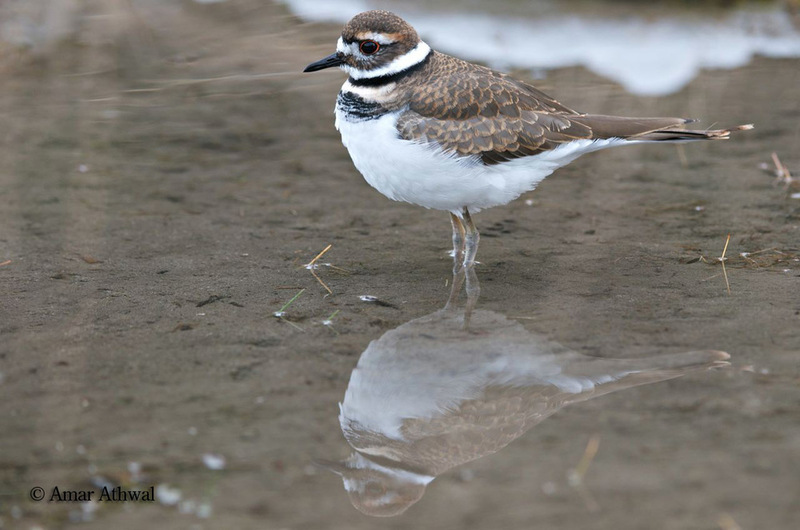 Then just behind me lands a Killdeer, so named for one of its call ( "kill-dee", "kill-deear", "kill-deeah-dee-dee"). It was so close to me, I initially had a problem getting it in focus. Ever so careful as not to make a quick or a wrong move that would scare the bird away, I backed a step. Wanted to take advantage of having the Killdeer so near me, to capture all of its exterior features. It stood still waiting to see what I was going to do, I slowly squatted to get the pictures I wanted. It soon started to move about, looking for food in the shallow water. Before I left, I softly said a thank-you before walking away, leaving the bird feeding and waiting for fall to return. Sometimes the odd Killdeers will spend their winter by the marsh, because of the warm water coming from the springs. If this is one of them, we may meet again.